STOP HS2 | Will dropping the HS2 link to the Channel Tunnel break EU law? Will dropping the HS2 link to the Channel Tunnel break EU law? Following last weeks ‘HS2 Plus’ report from Sir David Higgins which proposed the removal of the proposed link between HS1 & HS2 through Camden, Transport Secretary Patrick McLoughlin has confirmed in the House of Commons that he will be seeking to remove this provision from the HS2 Hybrid Bill, a move which may well see the UK taken back to court by the EU. 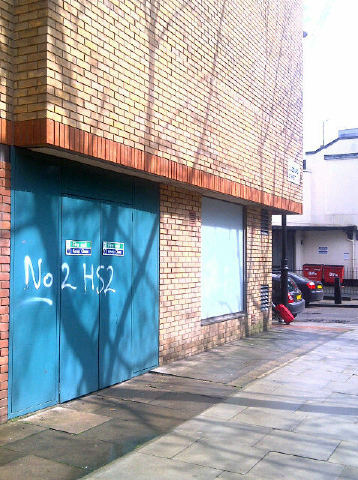 HS2 – The view from Camden. Whilst mainstream politicians have consistently claimed that the HS2 programme is not being driven by the EU, the UK has previously been found guilty of failing to implement an EU directive on the interoperability of the trans-European high-speed rail system. Directive 96/48/EC aims to ease the circulation of high-speed trains through the various train networks of the European Union, with Member States asked to harmonise their high-speed rail systems in order to create an interoperable European network. Years ago -and long before HS2 was “finalised”-there was a plan suggested to build a new station for high speed trains, on the (roughly triangular) area lying between the approach tracks to St Pancras and Kings Cross, then occupied mainly by a former gas works. This plan was not proceeded with as being “too expensive” and subsequently instead, St Pancras was rebuilt -a magnificent restoration, but with perhaps rather too much emphasis on the retail side, and more importantly, with the Midland services pushed back up the line and the domestic “javelin” fast trains to the Kent coast squeezed on to the other side ,beyond the international platforms -and without even their own ticket office, just a machine. It’s ok if you know where to look. Despite the millions spent on both main line termini, it would seem that there is little room for further expansion while of course the Kings Cross Lands area has now gone for redevelopment. Contrast this with, for example ,the enormous new station building in Madrid, which is built behind the original handsome terminus, which itself houses the shopping area. Perhaps, if the E.U. directive requires a link, then London should follow Madrid’s example and apply for a substantial grant from the E.U. Regional Development Fund to make up the cost.